The more I add to this mod, the more I wish I hadn’t included “painted” in the name. There’s more standard accessories in it now than there are painted stuff. Oh well. Maybe I’ll rename it next year. In the mean time the mod has now been updated to include full and half headlights for the grill lights, which also include white or orange strobe options. The chassis (main) lights have also been updated to include strobe options and the Scania logo is now a paintable accessory as well. Rather than the usual screenshots, have two videos. 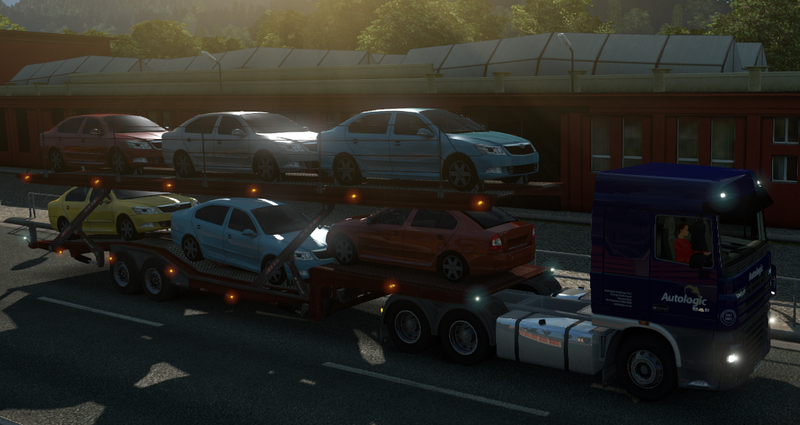 A small flurry of mods were updated over the last few days, the ATS and ETS2 Money & XP mods have been updated to the lastest game versions. Scania R/S and Peterbilt 389 have been added to their respective money/money-gone mods. The painted Scania intake/grill has been updated to include the multinode stock inlay. Please note I am debating changing the name of this mod to Scania Accessory pack and potentially including my painted Scania S/R intakes and side panels. Also coming later today is the Stock SCS painted company vans for Italy. The mod is already uploaded I am just waiting on the DLC to officially release and the link will be added on the appropriate page, workshop version will also be enabled. A second blog post tonight as I update three mods. First up my Engines mod has been updated and is now 1.28 functional (due to changes it is no longer 1.27 compatible). The DAF E6 now also has an appropriate badge. Secondly the Scania Painted Intakes mod has been updated, not only have I fixed the slight discolouration (darker than main truck) I have also added the second UVmap so that they also work with all of SCS skins. There will be at least one more update for this mod at a later date, at which time I will also clean up any issues I may have missed in this one. Be aware the Scania Painted Intake mod has had a file name change too. Be sure to manually remove the old one. PC Hamilton has also been updated. Somewhere along the way the trailer “broke”. I am certain I updated the trailer but for what ever reason it had reverted to an older version pre-1.24 so the trailer sat too low and the advanced coupling was missing. Not entirely sure how this happened, but it’s fixed now. So I have finally updated the new Scania Intake mod. As some of you may have noticed, it was a bit of a rush job to get it out for people who updated from 1.23x to 1.24x so some of the grills were not aligned properly. All grills are now aligned correctly. The lights have changed from the low quality flat leds used on sunshields, to one of the accessory lights giving it a much better (and 3d) look. I have also included a fourth variant of the grill that has custom light nodes allowing you to add your own lights, where ever you want them. The mod as standard includes the SCS smalllights, but if you have light packs and know how to edit them to add the suitable_for: “f_intake_cab” line you can add more of your own. Two more skins find their way into the RJL’s Scania pack. Lily Jean for Stobart rail on the normal roof R and Explore for the Highline Streamline. Download links in the usual place. 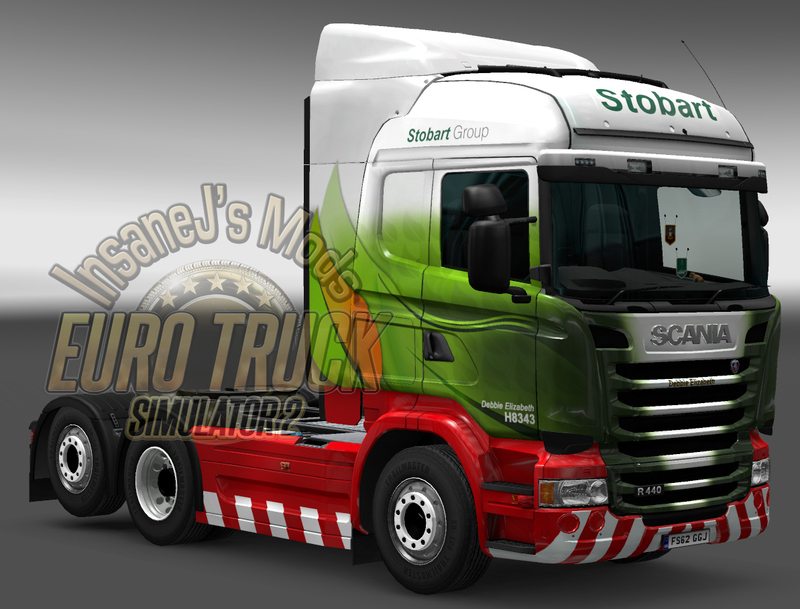 The Big Stobart Mod v6.1 has been released. You may notice the switch from 6.0.6 > 6.1 basically it means the BSM with AI is in a release stage that I am happy with. As a result there will be no more updates any time soon. There are still things I plan to add to it and there are things I will change in due course. But for now I am happy with its progress and status and will be looking towards some other mods. This skin has been finished for a few days, I held off releasing it because I wanted to release another brand new mod along side it, but I became side tracked by a “secret project” I am working on. As a result I have decided to release the first of my RJL only skins. Please be aware that the RJL skins have been made for specific parts as I wanted to make them as close to the real deal as possible, because of this some alternate parts may not look right. 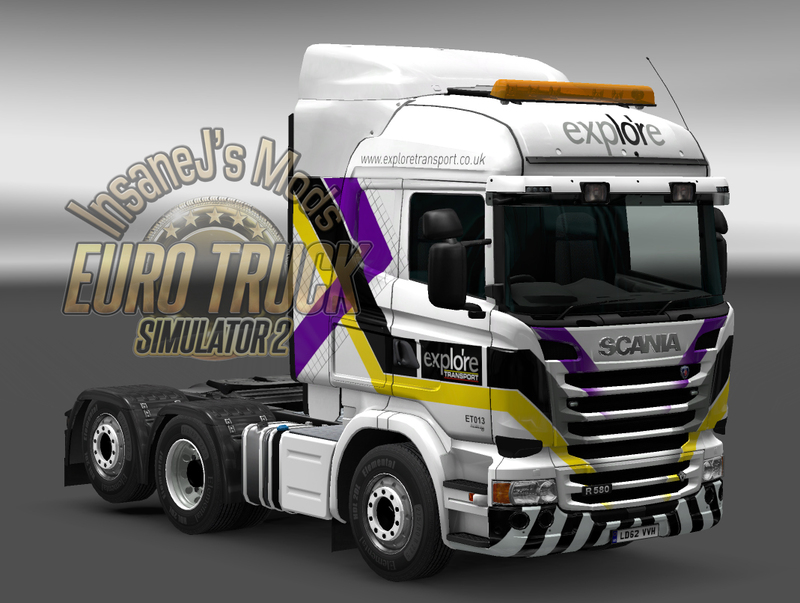 I’m really pleased by how this skin turned out and I am thinking of reworking it for the SCS trucks as well. It is far better than my original skin. 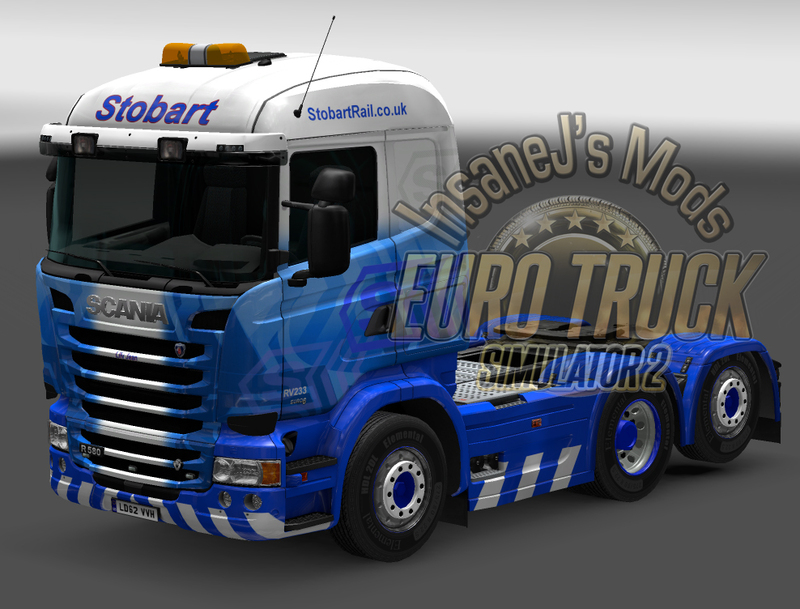 The download can be found at the bottom of the Stobart Skins page.